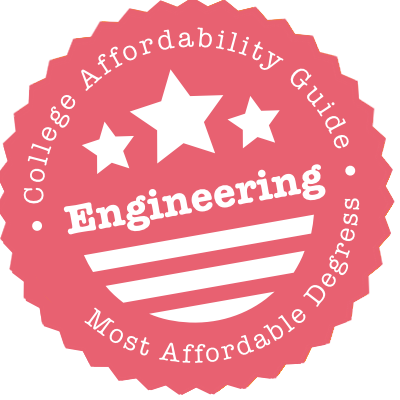 Scroll down to see the most affordable engineering degrees, as well as info on the different types of engineering degrees and engineering program accreditation. UC Irvine's Henry Samueli School of Engineering offers Bachelor of Science (BS), Master of Science (MS), and Doctor of Philosophy (PhD) degrees in general engineering, as well as in biomedical, civil, materials science, and software engineering. BS degrees (only) are available in aerospace, chemical, computer science and engineering, electrical, environmental and mechanical engineering. The MS in Engineering Management program is jointly administered by the Henry Samueli School of Engineering and the Paul Merage School of Business. MS and PhD programs are available in the following fields: chemical and biochemical engineering, electrical and computer engineering, mechanical and aerospace engineering, and networked systems. Incoming freshmen and transfer students with excellent academic backgrounds may be eligible to receive the Henry Samueli Endowed Scholarship ($7,500). UMD's Swenson College of Science and Engineering offers a Bachelor of Science (BS) degree in the following fields: Chemical Engineering, Civil Engineering, Electrical and Computer Engineering, Electrical Engineering, Industrial Engineering, and Mechanical Engineering. Master of Science (MS) programs are available in Civil Engineering, Electrical Engineering, Engineering, and Engineering Management. Swenson College offers students educational enrichment opportunities such as global internship programs and a Summer Bridge Program for incoming UMD freshmen from underrepresented groups. The Iron Range/UMD Graduate Engineering Education Program offers Master of Engineering (MEng), Master of Science in Engineering Management (MSEM), and Master of Environmental Health and Safety (MEHS) programs. This is a distance learning program and classes held at Mesabi Range College in Virginia are taught by UMD faculty. TAMU's Dwight Look College of Engineering offers 13 Bachelor of Science (BS) programs that are accredited by the Engineering Accreditation Commission of ABET (Accreditation Board for Engineering and Technology). These programs are the following: Aerospace Engineering, Biological and Agricultural Engineering, Biomedical Engineering, Chemical Engineering, Civil Engineering, Computer Engineering, Electrical Engineering, Industrial Engineering, Mechanical Engineering, Nuclear Engineering, Ocean Engineering, Petroleum Engineering, and Radiological Health Engineering. Master of Science (MS), Master of Engineering (MEng), and Doctor of Philosophy (PhD) degrees are available in all these fields except for Mechanical Engineering (no MEng degree) and Radiological Health Engineering (only BS degree offered). The college offers a Fast Track BS/MS program that lets students complete both BS and MS degrees in five years. At UNC Chapel Hill, the Department of Environmental Sciences and Engineering is part of the Gillings School of Global Public Health. The department offers a Master of Science program in Environmental Engineering (MSEE). There is also a dual MSEE-MCRP (Master of City and Regional Planning) program available. Additionally, the department has a Doctor of Philosophy (PhD) program in Environmental Science and Engineering. Seminars are held regularly to enhance and complement student learning, and students are given the opportunity to engage in independent or faculty-supervised research projects throughout the course of their studies at UNC. The Henry Samueli School of Engineering and Applied Science offers Bachelor of Science (BS), Master of Science (MS) and Doctor of Philosophy (PhD) degrees in the following fields of engineering: bioengineering, chemical and molecular, civil and environmental, materials science, electrical, aerospace, and mechanical. MS degrees (only) are also offered electronic materials, integrated circuits, manufacturing and design, signal processing and communications, and structural materials engineering. At the current time, only a general MS in Engineering degree can be pursued online. Engineering students can apply for several scholarship opportunities, including the Jon C. Jones Memorial Scholarship ($5,000, any major), the W. J. Knapp Scholarship ($5,000, materials engineering majors), and the Northrop Grumman Endowed Scholarship ($5,000, mechanical, aerospace, or electrical engineering majors). UIC's College of Engineering is stacked with undergraduate and graduate programs. Undergrads can major in everything from Bioengineering to Mechanical Engineering. And the College of Engineering Scholarship program hands out 40+ awards and over $150,000 yearly to new and continuing students. Female candidates benefit from the UIC College of Engineering Women's Scholarship Program, which controls the pursestrings to several major awards for incoming freshmen with strong academic backgrounds. Nearly all of the baccalaureate degrees have master's-level counterparts, including the Master of Energy Engineering. The Engineering Career Center works with current students and alumni to find internships and employment, and schedules sessions to help candidates boost their resumes and create networking strategies. The Bourns College of Engineering at UC Riverside runs half a dozen baccalaureate programs and even more master's and doctoral programs. One of the best ways for students to save money is by thinking ahead. The combined BS/MS in Chemical and Environmental Engineering, BS/MS in Computer Sciences and Engineering and BS/MS in Electrical Engineering programs all cut down on required credits and help students earn an advanced degree in less time than normal. But the best funding goes to PhD candidates, who typically earn fellowships and assistantships that waive tuition and fees while providing health insurance and salaries in the $20,000 range. Another bonus: Graduate-level application fees are waived for U.S. residents. The Jacobs School of Engineering at UC San Diego offers Bachelor of Science, Master of Science, and Doctor of Philosophy degrees in the following fields of engineering: computer, electrical, aerospace, mechanical, chemical, structural, nanoengineering, and bioengineering. There is an integrated BS/MS program that allows academically qualified students to complete both degrees in five years. Some PhD programs offer specialization areas, such as structural engineering with a specialization in computational sciences, and engineering science with a specialization in multiscale biology. There are also PhD programs that are administered jointly with San Diego State University. Engineering majors can apply for the James W. Barnes Scholarship ($2,000); transfer students can apply for the Philip and Elizabeth Hiestand Scholarship for Transfer Engineering Students ($5,000). The College of Science and Engineering at the University of Minnesota Twin Cities offers baccalaureate programs in the following fields: Aerospace Engineering and Mechanics, Bio-Based Products Engineering, Biomedical Engineering, Bioproducts and Biosystems Engineering, Biosystems and Agricultural Engineering, Chemical Engineering, Civil Engineering, Computer Engineering, Electrical Engineering, Environmental Engineering, Geoengineering, Industrial and Systems Engineering, Materials and Science Engineering, and Mechanical Engineering. Master of Science (MS) and Doctor of Philosophy (PhD) programs are available in Aerospace Engineering and Mechanics, Biomedical Engineering, Chemical Engineering, Civil Engineering, Electrical Engineering, Industrial and Systems Engineering, Materials Science and Engineering, and Mechanical Engineering. MS degrees are offered in the following: Environmental Restoration Engineering and Science, Geoengineering, Infrastructure Systems Engineering, Infrastructure Systems Management and Engineering, and Software Engineering. Buffalo State offers ABET-accredited Bachelor of Science programs in Engineering Technology. Students who earn the B.S. in Mechanical Engineering Technology learn to apply engineering principals to practical problems and prepare for jobs in design and production for employers such as manufacturing companies and testing labs. Students earning the B.S. in Electrical Engineering Technology can select from two tracks. The Electronics track prepares them for jobs involving electronic and digital circuit design, control systems and robotics, or microwave communications. The Smart Grid track prepares students for jobs in fields such as electric power generation and transmission, or power systems monitoring and control. The engineering technology degrees require at least 51 major credits. SUNY Oswego grants a combined Bachelor of Science in Electrical and Computer Engineering. Students in the program can chose from four areas of concentration: embedded systems, robotics, biomedical instrumentation, or modern energy systems. The program is fairly small, with about 100 students, but once freshmen are accepted at Oswego they can declare the major without meeting additional requirements. Outside the classroom, engineering students can build robots and enter them in competitions by joining the Robotics Club. The university also has a chapter of the Institute of Electrical and Electronics Engineers that allows students to network with professionals. Scholarships open to engineering majors include the SCR Inc. Engineering Programs Scholarship, which grants $1,000 to two recipients. UC Berkeley offers Bachelor of Science (BS), Master of Science (MS) and doctoral degrees in the following fields of engineering: bioengineering, civil engineering, electrical engineering & computer science, industrial engineering and operations research, materials science & engineering, mechanical engineering, and nuclear engineering. In addition, BS degrees (only) are available in energy engineering, engineering math & statistics, engineering physics, and in environmental engineering science. There is a Master of Engineering program offered by the Coleman Fung Institute for Engineering Leadership, a Master of Translational Medicine (offered by the Department of Bioengineering with UC San Francisco), and a Master of Advanced Study in Integrated Circuits. The U.S. News & World Report (2016) ranks Berkeley Engineering as the third best engineering program in the country. The College of Engineering at UC Davis consists of the following departments: biological and agricultural engineering, biomedical engineering, chemical engineering and materials science, civil and environmental engineering, computer science, electrical and computer engineering, and mechanical and aerospace engineering. ABET-accredited Bachelor of Science degrees are offered by all the departments, with Master of Science and Doctor of Philosophy degrees available in biomedical, chemical, civil and environmental, electrical and computer, materials science, mechanical and aeronautical engineering. Master of Engineering and Doctor of Engineering degrees are offered in biological systems engineering and in civil and environmental engineering. Several engineering scholarships are available, including the Jane C. Elliott Memorial (under-represented groups, including female and disabled students) and the Robert Roy Owen Scholarship (biological systems engineering students). Appalachian State University offers a Master of Science in Engineering Physics, a program that incorporates hands-on, lab-based courses. The program takes students with little engineering background and provides them skills in areas such as physics, electrical engineering, and software engineering for robotics and automation. The master's program has three concentrations: systems and laboratory automation, instrumentation and automation, and nanoscience for advanced materials. The latter two concentrations lead to a Professional Science Masters. The program is housed in the Department of Physics and Astronomy, and faculty members have been involved in research for sponsors including NASA, where they helped develop instruments for the space shuttle and Mars rover. Mitchell Technical Institute offers a variety of programs under the heading Engineering Technologies, including automation controls, telecommunications, and GPS GIS mapping technology. The 80-credit automation controls program results in an Associate of Applied Science in five semesters, and students who take an additional two semesters can get an AAS in Automated Engineering. The AAS in Telecommunications is a 73-credit, five-semester program. Students interested in GPS GIS mapping technology can earn a one-year diploma or attend for a second year and get an AAS combined degree with a power line construction and maintenance option. The automation controls and telecommunications programs are both eligible for the Dakota Builds Scholarship, which covers tuition and fees for two years of study. The College of Engineering at UMass Amherst offers Bachelor of Science (BS) degrees in the following fields: Chemical Engineering, Civil Engineering, Computer Systems Engineering, Electrical Engineering, Industrial Engineering, and Mechanical Engineering. All these programs are accredited by the Engineering Accreditation Commission of ABET (Accreditation Board for Engineering and Technology). Master of Science (MS) and Doctor of Philosophy (PhD) programs are available in Chemical Engineering, Civil Engineering, Electrical & Computer Engineering, Industrial Engineering, and Mechanical Engineering. An MS program is available in Environmental & Water Resources Engineering and in Engineering Management. The college offers two BS to MS five-year programs in Electrical & Computer Engineering and in Mechanical & Industrial Engineering. Through its School of Computing, Engineering and Environment, Saint Cloud State University offers undergraduate programs in electrical engineering, manufacturing engineering and mechanical engineering, as well as a graduate program in engineering management. Both the BS in Mechanical Engineering and the BS in Manufacturing Engineering include coursework in mathematics, science, computer science, engineering, and mechanical and electronic design. The mechanical engineering degree, however, prepares students for jobs in product or process design, research and development, or project engineering in an industrial setting, while the manufacturing engineering degree prepares students for jobs in process design, production, facilities layout, tool design, or project engineering in a manufacturing environment. The College of Science and Engineering offers several scholarship opportunities to its students, including the $2,500 College of Science and Engineering Dean's Scholarship. The College of Engineering at Michigan Technological University offers undergraduate majors in engineering, biomedical engineering, chemical engineering, civil engineering, computer engineering, electrical engineering, environmental engineering, geological engineering, materials engineering and mechanical engineering. Additionally, graduate degree programs are available in biomedical engineering, chemical engineering, civil engineering, computer engineering, electrical engineering, engineering mechanics, environmental engineering, environmental engineering science, geological engineering, materials science and engineering, mechanical engineering and mining engineering. Undergraduate engineering majors take the same core courses regardless of their specific major, so many first-year engineering students wait until after completing their first two semesters before choosing their major. Undergraduate engineering students also have the opportunity to participate in student organizations and a senior design program, in which they work with other students to find a solution to a design challenge. Wayne State College boasts one of the most reasonable tuition rates in the region, so the concept behind its Pre-Engineering program is an intriguing one. The program combines physics, chemistry and math coursework designed to prepare undergrads to transfer into a baccalaureate engineering program elsewhere. Or they can stay, finish their four-year degree, and use the Pre-Engineering courses to pursue master's-level studies. In terms of aid, the Melvin and Helen Allen Endowed Scholarship goes to STEM-inclined public high school graduates with financial need who have been overlooked for other awards. The School of Engineering Technology at Farmingdale State University, a SUNY school, uses experiential learning and current technologies to prepare students for technical and managerial roles. Undergraduate degrees are available in fields such as architectural engineering technology, computer engineering technology, electrical engineering technology, manufacturing engineering technology, and mechanical engineering technology. The department recently introduced its first graduate program, a Master of Science in Technology Management. Engineering technology students can apply for a range of scholarships, including the D3 LLC scholarship, a $1,000 award given to 10 students who are at least sophomores, and the 110 Sand Company Scholarship for construction management engineering majors. CSULB offers Bachelor of Science and Master of Science degrees in aerospace, civil, electrical, and mechanical engineering. Chemical, computer, and construction engineering management programs are available only on the baccalaureate level. There is a BS in Engineering degree with an option in biomedical and clinical engineering and a BS in Engineering Technology degree with options in computer engineering technology and in electronics engineering technology. A Doctor of Philosophy (PhD) in Engineering and Industrial Applied Mathematics program is also available. This is a joint program with the Claremont Graduate University. There are several scholarship opportunities available for both undergraduate and graduate students, such as the Boeing Engineering Honors Awards and the Edison Scholars Program. Engineering scholarship award amounts range from $500 to $2,500. The College of Science and Engineering at Winona State University offers a Bachelor of Science (BS) in Composite Materials Engineering. The college offers pre-engineering course sequence for students who are undecided about pursuing the BS in Composite Materials Engineering program. There is also a General Education Program for CME majors where students are required to take courses from the following General Education Goal Areas: Communication, Critical Thinking, Natural Sciences, Mathematics/Logical Reasoning, History and the Social Behavioral Sciences, Humanities and Fine Arts, Human Diversity, Global Perspective, Ethic and Civil Responsibility, and People and the Environment. In addition, students pursuing this program are required to take the Fundamentals of Engineering (FE) exam prior to graduation. SUNY University at Albany recently added it first engineering degree, a Bachelor of Science in Computer Engineering, which is offered through the new College of Engineering and Applied Science. The CEAS plans to add four more undergraduate degrees as well as graduate degrees. One of the degrees being planned is in environmental and sustainable engineering. Incoming freshmen in the computer engineering major can live in special-interest on-campus housing, or a living/learning community called The World of Engineering and Applied Science. Creation of the CEAS marks UAlbany's largest academic expansion in 50 years, and the college is expected to help revitalize downtown Albany. Engineering faculty has been recruited from major universities around the U.S.
Stony Brook University's College of Engineering and Applied Sciences offers undergraduate majors in biomedical engineering, chemical and molecular engineering, civil engineering, electrical engineering, engineering science and mechanical engineering. Accelerated bachelor's/master's programs are also available in biomedical engineering, materials science and engineering, electrical engineering and mechanical engineering. Additionally, several engineering graduate degrees are offered, including MS and PhD degrees in the same four disciplines as the accelerated bachelor's/master's programs. The College of Engineering and Applied Sciences provides a variety of scholarship opportunities, including the $1,000 Thomas F. Irvine Undergraduate Scholarship in Mechanical Engineering and the $1,000 Lawrence E. Noonan Scholarship. Thaddeus Stevens College of Technology has programs in computer software engineering technology, electronic engineering technology, mechanical engineering technology, and engineering CAD technology. Each of these associate-degree programs requires 73 credits, and students can earn the degree in four semesters. Students in the mechanical engineering program are eligible for the Turkey Hill Dairy Scholarship, which awards two students $1,250 plus another $500 to cover the costs of support tools needed for the program. One of the scholarships is designated for a female student. The Williams Gas Pipeline scholarship is open to electronic engineering technology students, with preference given to under-represented populations in the program, such as women and minority students. The scholarship is worth up to $5,000 annually. Lake Area Technical Institute (LATI) in Watertown, South Dakota, has Associate of Applied Science degrees in Automotive Technology and Diesel Technology. Students in either program are eligible for the Build Dakota Scholarship, which provides recipients with tuition, fees and books in exchange for a three-year work commitment within the state. Since these degree programs require students to purchase $5,000 to $10,000 worth of tools, enrollees should also pursue funds from the LATI Foundation. Five endowed funds are earmarked for Automotive Technology students, and eight for Diesel Tech students. And since LATI has the highest graduation rate of any public community or technical college in the nation - 76 percent - students shouldn't be saddled with unnecessary debt. UC Santa Barbara's College of Engineering offers Bachelor of Science degrees in chemical, electrical, and mechanical engineering that are accredited by the Engineering Accreditation Commission of ABET (Accreditation Board for Engineering and Technology). There is also a BS in Computer Engineering degree, as well as a combined BS/MS program that allows academically outstanding computer engineering students to earn both degrees in five years. On the graduate level, Master of Science and Doctor of Philosophy programs are available for chemical and mechanical engineering, and for the combined fields of electrical and computer engineering. Engineering students can apply for a number of scholarships (with varying amounts) including the Charles S. Chapman Scholarship, the Hearst Foundation Scholarship, and the Dr. Robert and Sue Talley Scholarship. Iowa State University's College of Engineering offers programs in aerospace engineering; agricultural and biosystems engineering; chemical and biological engineering; civil, construction and environmental engineering; electrical engineering; industrial and manufacturing systems engineering; materials science and engineering; and mechanical engineering. Accelerated bachelor's degrees, which can be completed in three years, are offered in industrial engineering, materials engineering and mechanical engineering. Additionally, concurrent degree programs where students can earn a bachelor's and master's degree in five years are available in agricultural engineering, chemical engineering, civil engineering, electrical engineering, industrial engineering, materials engineering and mechanical engineering. ISU's College of Engineering awards over $500,000 in general merit scholarships to first-year students, and many current engineering students receive scholarships that range between $250 and $12,000 per year. Ferris State University's School of Engineering and Computing Technology offers programs in electrical/electronics engineering technology, energy systems engineering, mechanical engineering technology, product design engineering technology and surveying engineering. The BS in Electrical/Electronics Engineering Technology focuses on the engineering of electronics, automation, and computers through coursework in high level programming, network analysis, electric power and industrial automation controls. The AAS and BS in Mechanical Engineering Technology teach students how mechanical systems perform through coursework in engineering graphics and CAD, manufacturing processes and computer applications, applied mathematics and physics. Scholarships available through the School of Engineering and Computing Technology include the Daniel Tyler Scholarship and the David P. Prior Scholarship. Doctor of Philosophy (PhD) degrees. BS, MS, ME and PhD programs are offered in: Mechanical & Aerospace Engineering, Agricultural & Biological Engineering, Biomedical Engineering, Chemical Engineering, Civil Engineering, Computer Engineering, Electrical & Computer Engineering, Environmental Engineering Sciences, Industrial & Systems Engineering, Materials Science & Engineering, Mechanical Engineering, and Nuclear Engineering Sciences. Students can earn an MS, ME, or PhD degree in Coastal & Oceanographic Engineering, while the Computer Science and the Digital Arts & Sciences departments only offer BS and MS programs. Eleven Engineering programs have ABET accreditation - Aerospace, Biological, Chemical, Civil, Computer, Electrical, Environmental, Materials Science, Industrial and Systems, Mechanical, and Nuclear Engineering. UIUC's College of Engineering has 12 departments that offer the following programs: 15 undergraduate engineering degrees, 8 minors, 12 graduate degree programs (Master of Science, Master of Engineering, and Doctor of Philosophy in Engineering), and 4 dual-degree programs. Qualified students can also enroll in the combined Bachelor's/Master's program that allows them to earn both degrees within five years. At the current time, BS/MS programs are available in computer science, electrical and computer engineering, and in materials science and engineering. In addition to traditional on-campus programs, MS degrees in the following fields can be pursued online: computer science, aerospace engineering, civil & environmental engineering, and mechanical engineering. There are also 18 certificate programs and hundreds of engineering courses that are available online. Alfred University's School of Engineering offers undergraduate majors in biomaterials engineering, ceramic engineering, glass engineering science, mechanical engineering, materials science and engineering, and renewable energy engineering. Additionally, graduate programs are available in biomaterials engineering (M.S. ), ceramic engineering (M.S. and Ph.D.) glass science (M.S. and Ph.D.), electrical engineering (M.S. ), materials science and engineering (M.S. and Ph.D.) and mechanical engineering (M.S.). Students who choose an undergraduate engineering major complete between 131 and 133 credits of coursework total, including courses in five broad categories: mathematics, physical sciences, engineering, materials sciences and mechanics. Students in all six engineering majors complete either a design project or a thesis. Additionally, engineering students have the opportunity to complete internships, faculty-led research and leadership training. The Thomas J. Watson School of Engineering and Applied Science at Binghamton University offers undergraduate and graduate programs in biomedical engineering, electrical and computer engineering, mechanical engineering, and systems science and industrial engineering. Graduate programs are also offered in materials science and engineering. In addition to the BS, MS and PhD programs offered, Binghamton University's School of Engineering offers a fast-track BS/MBA program to undergraduate students majoring in bioengineering, computer engineering, electrical engineering, industrial systems engineering, and mechanical engineering. Students enrolled in the Watson School of Engineering are eligible for a long list of scholarships, including the Ahilya Devi Memorial Scholarship for mechanical engineering students and the Naiju Lu and Xihong Luo Scholarship for Engineers. Michigan State University's College of Engineering offers bachelor's degrees in applied engineering sciences, biosystems engineering, chemical engineering, civil engineering, electrical engineering, environmental engineering, materials science and engineering, and mechanical engineering. Additionally, master's and doctoral degrees in electrical engineering are available. The undergraduate major in applied engineering sciences provides students with a foundational understanding of engineering and how it applies to one of the following concentrations: business law, computer science, packaging, supply chain management, technical sales and telecommunications. The biosystems engineering major combines biology with engineering, with optional concentrations in bioenergy engineering, biomedical engineering, ecosystems engineering and food engineering. The College of Engineering awards more than 300 undergraduate scholarships each year with awards ranging from $100 to $13,000. The Jack Baskin School of Engineering at UC Santa Cruz offers Bachelor of Science degrees in bioengineering, bioinformatics, robotics, electrical, and computer engineering. There is a BS/MS program in computer engineering that allows qualified students to complete both degrees in five years. On the graduate level, MS and PhD degrees are available in computer and in electrical engineering. MS programs are offered in engineering and in bioinformatics, and a PhD program is available in biomedical sciences and engineering. Engineering students with excellent academic performance and demonstrable financial need are considered for the David S. Lee Scholarship ($1,000 to $2,000). Students from under-represented groups (such as re-entry or female students) are considered for the Mary Katherine Long Endowed Prize ($1,250). The College of Engineering and Applied Science at UCCS offers Bachelor of Science (BS) degrees in the following: Computer Engineering, Computer Science, Electrical Engineering, and Mechanical Engineering. All these programs are accredited by the Engineering Accreditation of ABET (Accreditation Board for Engineering and Technology). On the graduate level, students can earn Master of Science (MS) degrees in the following areas: Computer Science, Electrical Engineering, Mechanical Engineering, and Computer Science - Focus in Media Convergence, Games, and Media Integration. Students can also pursue a Master of Engineering (MEng) program in Engineering Management, Information Assurance, Software Engineering, Space Operations, and Systems Engineering. Doctor of Philosophy (PhD) programs are available with the following concentration areas: Computer Science, Electrical Engineering, Mechanical & Aerospace Engineering, and Security. The College of Engineering and Computer Science at Cal State Fullerton offers Bachelor of Science (BS) and Master of Science (MS) degrees in civil and environmental engineering, computer engineering, electrical engineering, and mechanical engineering. The software engineering and environmental engineering programs are only offered on the graduate level (MS) and are available online. The BS in Civil Engineering program has an emphasis in architectural engineering, while the MS in Electrical Engineering program offers an option in systems engineering. There is also a BS-MS program in computer engineering. Full-time new or continuing engineering students with an excellent academic history can apply for the Boeing Company Next Generation Scholarship ($5,000/year). The ECS Academic Catalyst for Excellence (ACE) Scholarship ($4,000/year) supports academically outstanding engineering freshmen. Brigham Young University-Idaho offers several engineering degrees through its Department of Computer Science and Electrical Engineering and its Department of Mechanical Engineering. The Computer Science and Electrical Engineering Department offers an AAS in Electrical and Computer Engineering and BS degrees in electrical engineering and software engineering, while the Mechanical Engineering Department offers AAS degrees in engineering and engineering technology and BS degrees in civil engineering and mechanical engineering. In the BS in Electrical Engineering program, students study electrical and electronic systems. In the mechanical engineering bachelor's program students take foundational courses in mathematics, engineering science, solid mechanics and thermal sciences and can focus their studies on one of several concentration areas, including computer aided engineering, engineering management, engineering mechanics and manufacturing engineering. The Grove School of Engineering at City College of New York oversees 15 research institutes in fields ranging from nanotechnology to sustainability, providing students with many opportunities to be involved in research. The Grove School has departments covering biomedical, chemical, civil, electrical, and mechanical engineering, and computer science. Each department offers a bachelor's, master's and Ph.D. program, and students may also earn a Bachelor of Engineering in Computer Engineering, Bachelor of Engineering or Master of Science in Earth Systems & Environmental Technology, or Master of Science in Information Systems, Translational Medicine, or Urban Sustainability. The Grove School provides a special orientation program, town hall meetings, ring ceremony, and other events to foster a sense of community among engineering students. SUNY Polytechnic Institute offers several undergraduate programs for students interested in engineering. Options include a Bachelor of Science in Civil Engineering, Civil Engineering Technology, Computer Engineering Technology, Electrical and Computer Engineering, Electrical Engineering Technology, Mechanical Engineering, Mechanical Engineering Technology, and Nanoscale Engineering. SUNY Poly also offers a Master's of Science and Ph.D. in Nanoscale Engineering. The Nanoscale Engineering programs are only available at the SUNY Poly campus in Albany. Most of the engineering programs are accredited by ABET, and SUNY Poly is seeking accreditation for the other programs. Students in the engineering programs can join chapters of several engineering professional organizations, and campus engineering clubs are involved in design-build competitions that take students to regional and national meets. The William States Lee College of Engineering at UNC Charlotte offers bachelor, master's and doctoral degrees in a variety of engineering fields. These include degrees in civil engineering, electrical and computer engineering, and mechanical engineering. The college also grants a B.S. in Systems Engineering, M.S. in Engineering Management, and Ph.D. in Infrastructure and Environmental Systems. Students in the Bachelor of Science in Engineering Technology program can choose a concentration: Civil Engineering Technology, Electrical Engineering Technology, Fire Safety Engineering Technology, or Mechanical Engineering Technology. Engineering faculty members are actively engaged in applied, interdisciplinary research. Students learn by doing, and most classes include design-and-build projects or other hands-on learning. Students also gain real-world experience through internships and cooperative education. The College of Engineering at the University of Idaho offers Bachelor of Science (BS), Master of Engineering (M.Engr. ), Master of Science (MS), and Doctor of Philosophy (PhD) degrees in biological, chemical, civil, computer, electrical, and mechanical engineering. An M.Engr. program in engineering management is available, in addition to BS, MS and PhD degrees in the field of materials science and engineering. Students interested in nuclear engineering can pursue M.Engr., MS and PhD degrees in this field. The College of Engineering has an Engineering Outreach distance education program that delivers 10 graduate degrees and 5 academic certificates online. Several scholarships with variable award amounts are available to undergraduate and graduate engineering students, including the Ernsberger Engineer's Fund and the D.W. Fitzsimmons Scholarship. The University of North Texas offers a B.S. in Biomedical Engineering, Computer Engineering, Materials Science and Engineering, Mechanical and Energy Engineering, and Electrical Engineering; a B.S.E.T. in Electrical Engineering Technology, Mechanical Engineering, Construction Engineering Technology, and Nuclear Engineering Technology; an M.S. in Computer Engineering, Electrical Engineering, Engineering Technology, Material Science and Engineering, and Mechanical and Energy Engineering; a Ph.D. in Computer Science and Engineering, Electrical Engineering, Materials Science and Engineering, and Mechanical and Energy Engineering. With exceptional research facilities and a dedicated faculty, UNT provides a unique learning experience for all engineering students. The Lyles College of Engineering at Fresno State offers Bachelor of Science degrees in civil, computer, electrical, geomatics, and mechanical engineering, which are accredited by the Engineering Accreditation Commission of ABET (Accreditation Board for Engineering and Technology). Master of Science degrees are available in engineering and in civil engineering. A new graduate option (MS in Civil Engineering - Water Resources and Environmental Engineering) is now available. Qualified undergraduates can apply for admission to the college's accelerated master's program that lets them begin their graduate studies during their senior year in high school. Students admitted to the Honors Program receive the Husband-Boeing Scholarship or the Lyles Family Honors Scholarship, which cover full tuition (8 semesters for entering freshmen; 4 semesters for transfer students). The College of Engineering and Computer Science at CSUN offers Bachelor of Science degrees in civil, computer, electrical, manufacturing systems, and mechanical engineering. All these programs are accredited by the Engineering Accreditation Commission of ABET (Accreditation Board of Engineering and Technology). The department will be seeking accreditation in the future for its latest engineering program, BS in Engineering Management. Master of Science degrees are available in the fields of structural, electrical, computer, mechanical, engineering management, and manufacturing systems engineering. Students can take advantage of research opportunities at the Energy Research Center and the Center for Engineering and Computer Science Research and Education. Full-time engineering students can apply for the Edison Scholars Scholarship, which awards several $4,000 to $5,000 scholarships each year. The College of Engineering at Cal Poly Pomona graduates about 1 of every 14 engineers in California. The college offers Bachelor of Science degrees in the following fields of engineering: aerospace, chemical, civil, electrical, computer, engineering technology, industrial, manufacturing, and mechanical. Students can pursue a Master of Science (MS) degree in civil, electrical, and mechanical engineering as well. MS in Engineering programs are also available in engineering management, systems engineering, engineering with emphasis on aerospace, and engineering with emphasis on materials engineering. Each year, three female Engineering majors are selected for the Young Leaders in Engineering Scholarship ($7,500). The STEM Inclusion Scholarship ($500) supports students belonging to under-represented groups as defined by gender, race, ethnic background, socio-economic status, etc. USF's College of Engineering offers Bachelor of Science degrees in chemical, civil, computer, electrical, industrial, and mechanical engineering. These programs are all accredited by the Engineering Accreditation of ABET (Accreditation Board for Engineering and Technology). Master of Science and Doctor of Philosophy degrees are available in all the fields above, in addition to biomedical and environmental engineering. There is also an MS degree in materials science engineering available. MS programs in engineering management and in electrical engineering for professionals, as well as graduate certificates in systems engineering and in wireless engineering are available online. Undergraduate and graduate engineering students can apply for a number of scholarships (with varying amounts), including the Edward W. Kopp Memorial Scholarship and the Franz Mantini Endowed Scholarship. Engineers are responsible for much of what makes our daily lives work. From medicine and computers to energy and infrastructure, engineering is a field full of creative – and lucrative – opportunities. In the 2013-2014 PayScale College Salary Report, six of the seven undergraduate majors with the highest salary potential were in engineering. Wondering where to start? We’ve got you covered. In our guide to affordable engineering schools, you’ll discover information on every major engineering discipline and degree. You’ll learn why ABET accreditation matters, what PE licensure requires and where you can go for help. Chemical engineers explore the practical applications of chemistry. They examine the chemical and mechanical processes behind production and use their knowledge to create new procedures and substances (e.g. food, pharmaceuticals, cosmetics, consumer products, etc.). Civil engineers design, build and maintain the infrastructures we rely on – railways, bridges, roads and buildings. They review safety measures, estimate project costs and liaison with private and public partners. Civil engineers also consider the best ways to improve or protect natural and man-made environments. Electrical engineers harness the power of electricity, electronics and electromagnetism and put it to practical use. They design components for computers and electrical utility systems for cities. They build technologies for cars, robots, green power, communication systems and much, much more. Sometimes viewed as a branch of civil engineering, geotechnical engineering focuses on the behavior of geological materials during engineering projects. Petroleum and mining engineering are the most famous examples of this discipline, but there are plenty of others. The engineers in this catchall category are concerned with designing, developing and improving systems. Systems engineers manage complicated engineering projects more efficiently; industrial engineers increase productivity and reduce waste; manufacturing engineers refine manufacturing processes and machines. Using principles of thermodynamics, structural analysis and mechanical power, mechanical engineers create complex engines and machines. They build MRIs and space shuttles, turbines and internal combustion engines. Associate of Arts (AA) in Engineering: Includes humanities courses. Associate of Science (AS) in Engineering: Has a science and math focus. Core courses will cover important engineering principles, math, calculus, physics and computer science. Hands-on instruction is given in labs. Both of these degrees are acceptable if you’re thinking about earning a bachelor’s degree down the track. In addition to subjects covered in the AA/AS, these degrees incorporate technical courses you might need to become an engineering technician (e.g. CAD, electrical circuits, computer programming, etc.). If you’d like to start work straight after graduation, choose one of these. An associate’s degree is a typical requirement for engineering technician jobs. However, only a bachelor’s degree can qualify you to work as an engineer. Around 1/3 of engineering technicians work in electrical engineering; the remainder find jobs in construction, manufacturing, sales and other fields. Once you have some experience under your belt, you might choose to seek certification from the National Institute for Certification in Engineering Technologies (NICET). A bachelor’s degree in engineering is a 4-year program that covers the theory and practical applications of engineering. This is the common starting point for working engineers and a prerequisite if you’re thinking of becoming an EIT and PE. With a good degree, you can go far. In a 2015 report, the National Association of Colleges and Employers predicted engineering majors to be the top-paid bachelor’s degree graduates. Bachelor of Arts (BA) in Engineering: Includes liberal arts courses (e.g. foreign language, social science, etc.). Bachelor of Science (BS) in Engineering: Includes courses that help build a strong technical foundation. A good choice for those wishing to become engineers straight after graduation. Core courses for both degrees generally include an engineering “core” (e.g. mechanics, materials science, physics, etc. ), natural science and higher math (e.g. calculus, algebra, etc.). Hands-on labs are usually required. At this level, most students choose to specialize in a discipline, which has an impact on the curriculum. For example, in addition to engineering classes, chemical engineers would take biochemistry, organic chemistry and physical chemistry. Employers want to see practical skills on your résumé. To improve your chances of landing a job, seek out programs that provide internships, co-ops and real-world experience. Thinking about the PE license? Your degree must have ABET accreditation. A master’s degree in engineering is a 2-3 year program focused on advanced engineering skills. It’s intended for BS or BA graduates who want to qualify for senior technical positions, move into leadership roles, expand their opportunities and deepen their learning. Degrees are available with a practical or theoretical focus. If you earn an accredited degree, the money and time will be worth it. 4 of the degrees in Monster.com’s list of 10 Best-Paying Master’s Degrees are in engineering. To give themselves even more career flexibility, some engineers also choose to earn their master’s in tandem with a PE license. Master of Science (MS) in Engineering: Research-based degree focused on engineering, math and science. A common choice for those who wish to work in advanced technical positions or earn a PhD. Master of Engineering (MEng): Practical degree designed for working professionals who wish to apply their knowledge to the field. Master of Engineering Management (MEM): Combines applied engineering and business/MBA principles. A popular pick for engineers who need to manage engineering teams and operations. MBA with a Technology Focus: Alternative to the MEM. Coursework will depend on your chosen discipline. In addition to courses in your area of specialization, you may be required to earn general engineering credits (e.g. statistics, computer science, advanced mathematics, etc.). Depending on the program’s focus, you may also have to complete a research thesis, capstone project and/or internship. However, since many master’s candidates often have solid real-world experience, 100% online programs are becoming more and more common. Want to narrow your choices? Look for programs with ABET accreditation, a strong investment in research projects and faculty with expertise in your specialization. Good schools will help arrange valuable internships or co-ops. A doctorate in engineering is a 3-6 year program designed for engineers who are deeply interested in advanced research and leadership. Graduates teach at the university level, act as government policy advisors or work as high-level consultants. Engineers interested in management positions may choose to earn a doctoral degree in business in order to vary their skill-set. Doctor of Philosophy (PhD) in Engineering: Research-based. Students complete original research in their field and write a dissertation detailing their discoveries. A good choice for engineers interested in academia and research. Doctor of Engineering (DEng): Equivalent in rigor to the PhD, but more focused on applied research than original research. A common choice for mid-career engineers tackling specific problems in their discipline. Strong doctoral programs will have award-winning faculty and a great reputation for research (e.g. high funding numbers, well-known research centers, government and business partnerships, etc.). Check if the undergraduate or master’s level programs have ABET accreditation. Although ABET does not accredit doctoral programs, this tells you the school is serious about standards. A certificate in engineering is a non-degree, academic program that takes around 6 months-1 year to complete. Online programs are particularly popular with working professionals. Engineers obtain certificates to fulfill continuing education credits, earn course credits for a degree, specialize in a field (e.g. engineering management, transportation engineering, etc.) and/or hone their skills in research or management. Undergraduate Certificates: Students earn these to gain experience in a certain area or qualify as engineering technician or specialist. They can be very hands-on (e.g. aviation mechanics). Graduate Certificates: BA or BS graduates earn these to specialize in their field, earn credits, open up new job opportunities or advance to management positions. One thing to note – a certificate in engineering is different from professional certification. Certificates are academic qualifications; certifications are granted by trade organizations and other bodies as a recognition of your professional expertise. Whichever engineering discipline you choose, we recommend you attend a regionally accredited college or university. Regional accreditation is a “seal of approval” granted to institutions by one of 6 regional accrediting bodies (e.g. Southern Association of Colleges and Schools). Regional accreditation is given to the overall institution. To see if an engineering program is any good, look for ABET accreditation. The Accreditation Board for Engineering and Technology, Inc. (ABET) accredits engineering, computer science and other applied science degree programs. Regional accrediting boards accredit the entire college or university. A degree with ABET accreditation is highly regarded in the field of engineering. ABET accredits online and on-campus programs at the undergraduate and graduate level, but it does not accredit doctoral programs. Applied Science Accreditation Commission (ASAC): Accredits applied science programs at the associate’s, bachelor’s or master’s degree level. Computing Accreditation Commission (CAC): Accredits computing programs at the bachelor’s degree level only. Engineering Accreditation Commission (EAC): Accredits engineering programs at the bachelor’s or master’s degree level. Engineering Technology Accreditation Commission (ETAC): Accredits engineering technology programs at the associate’s or bachelor’s degree levels. Attending an ABET-accredited program is very important if you’re thinking about becoming a civil engineer or a PE. It may not be as relevant for computer scientists or computer engineers. Becoming an Engineer in Training (EIT) or Engineer Intern (EI) is the first step towards earning a Professional Engineer license. Make no mistake – EITs are bona fide engineers. But they cannot offer PE services (e.g. bid for government contracts, stamp and sign drawings, etc.) without finishing the licensing procedure. Once you have passed the FE exam, the real work begins. Although each State Licensing Board has its own specific requirements, EITs must usually complete a 4-year work apprenticeship under the supervision of a PE in order to earn their PE License. The FE Exam is administered by the NCEES and its website tells you everything you need to know about taking the FE exam. Since every state has slightly different prerequisites for PE licensure, please check with your State Licensing Board for exact details. The PE Exam is administered by the NCEES and its website tells you everything you need to know about taking the PE exam. Land surveyors must hold a professional surveying license from the state. We provide general details below, but please check with your individual State Licensing Board for precise requirements. FS and PS Exams are administered by the NCEES and its website tells you everything you need to know about surveying licensure. Professional certifications are issued by trade organizations, professional groups and universities to working engineers. These groups normally expect you to take an exam and complete a certain amount of continued professional development hours each year. The Council of Engineering & Scientific Specialty Boards (CESB) assesses certification programs for quality. Unlike earning a license, obtaining certifications is a voluntary step – it tends to happen naturally as you progress up the engineering ranks. Ask your supervisor, professors and/or peers whether certification is worth pursuing at this stage in your career.